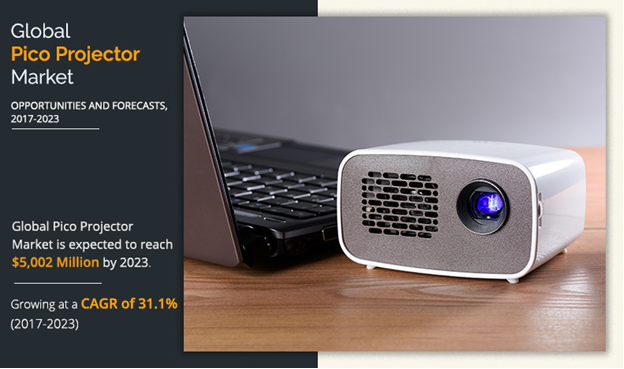 Global Pico projector market size is expected to reach $5,002.0 million by 2023, growing at a CAGR of 31.1% during the forecast period 2017&dash;2023. Pico projector, also known as pocket projector, handheld projector, mobile projector, or mini beamer is an image projector used to project image through a handheld device. These projectors are inbuilt in various devices such as mobile phones, tablets, and cameras, which makes them popular as pocket or pico projector. These are miniature video, image, or personal digital assistance (PDAs) projectors, which could be used in various applications where there is a need of projecting information on larger screens. The major companies profiled in the report include Texas Instruments, Inc., MicroVision, Inc, Aaxa Technologies, Inc., LG Electronics, Inc., Lenovo Group Ltd., Optoma Technology Corp., Syndiant, ZTE Corporation, Celluon, Inc., and Miroir USA. These key players have adopted product launch and product enhancement strategies to strengthen their pico projector market share. The pico projector market forecast is segmented based on technology, product, applications, compatibility, and region. Based on technology, the market is divided into digital light processing (DLP), laser beam steering, holographic laser projection, and liquid crystal on silicon (LCoS). By product, it is classified into embedded, non-embedded/standalone, and USB. The applications discussed in this study are consumer electronics, business and education, and others. The compatibility segment includes laptop/desktop, smartphones, digital camera, portable media players, and others. Based on region, the market is analyzed across North America, Europe, Asia&dash;Pacific, and LAMEA. Compact & flexible in nature, low brightness, and short battery backup impact the growth of the market. 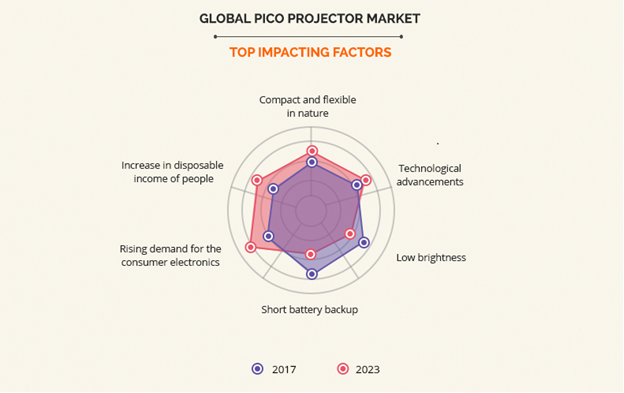 In addition, rise in demand for the consumer electronics, advancements in technology, and increase in disposable income of people also affect the growth of the global pico projector market. These factors are anticipated to either drive or hamper the pico projector market. Pico projectors are very much light in mass and small in size as compared with the traditional business projectors, which are considered as the bulky projectors. In addition, they are flexible in nature and can be connected to the number of devices such as DVD players, Laptops, PC, gaming stations, and cell phones. Thus, it can be easily carried by the user. For instance, pre-sales or sales person can carry pico projector with the ease and can give on-spot presentation or demonstration. Such advantages of pico projectors fuel the growth of the market. The low brightness of the projectors majorly hampers the growth of the market. Considering with the business projectors, which are in the range of 1,000/1,200 lumens, pico projector falls into the brightness range of 10-1,000 lumens, which requires the room to be dark enough so as to see the image clearly. This in turn restricts the pico projectors market growth. There is a rise in demand for the consumer electronics especially in the developing countries such as India, China, and others. Factors such as rise in disposable incomes, developments in middle class, and progressive government reforms propel the demand for consumer electronics. In addition, applications of pico projectors in the consumer electronics segment are expected to rise rapidly during the forecast period. The emergence of such applications drive the adoption pico projectors to a higher level in the future. The number of the smartphones and tablets are projected to witness growth in the upcoming years, which creates a room for the market expansion. This study comprises analytical depiction of the global pico projector market analysis with current trends and future estimations to depict the imminent investment pockets. The overall pico projector market potential is determined to understand the profitable trends to gain a stronger foothold. The pico projector market report presents information related to key drivers, restraints, and opportunities with a detailed impact analysis. The current market is quantitatively analyzed from 2017 to 2023 to benchmark the financial competency. Porter’s Five Forces analysis illustrates the potency of the buyers and suppliers in the pico projector market industry. The Pico projector market holds high potential for the display industry. Presently, there is an increase in demand for the pico projectors from developing countries such as China, India, and others. Companies in this industry adopt various innovative techniques to provide customers with advanced and innovative product offerings. The compactness and flexibility of the pico projectors make way for the growth of the market. In addition recent technological advancements also contribute to the market growth. However, Low brightness, and short battery backup of the pico projector impedes the growth of the market. In the near future, rise in demand for the consumer electronics, and increase in disposable income of people is expected to create lucrative opportunities for the key players operating in the pico projector market. Pico projector is an emerging technology, which applies the use of an image projector present inside the handheld device. In addition, advancements in technology used in pico projectors makes them more powerful, less expensive, and smaller in size as well. Among the analyzed geographical regions, Asia-Pacific is expected to account for the highest revenue in the global market throughout the forecast period (2017-2023) followed by North America, Europe, and LAMEA. 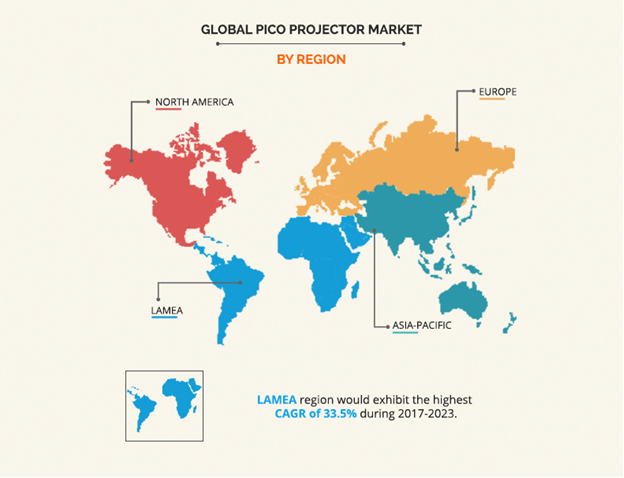 However, LAMEA is expected to grow at a higher growth rate, predicting a lucrative market growth for pico projectors. Texas Instruments, Inc., MicroVision, Inc, Aaxa Technologies, Inc., LG Electronics, Inc., Lenovo Group Ltd., Optoma Technology Corp., Syndiant, ZTE Corporation, Celluon, Inc., and Miroir USA are key market players that occupy a significant revenue share in the pico projector market.